Knoxville, TN – Holding Missouri to just 35.4 percent from the field, No. 1 Tennessee Vols topped the Tigers for the second time this season, 72-60, extending its winning streak to a program-best 17 games. The Vols (21-1, 9-0 Southeastern Conference) remain the only undefeated team in SEC play and push their conference regular season winning streak to 13, which ties a program record set in the 1979-80 season. 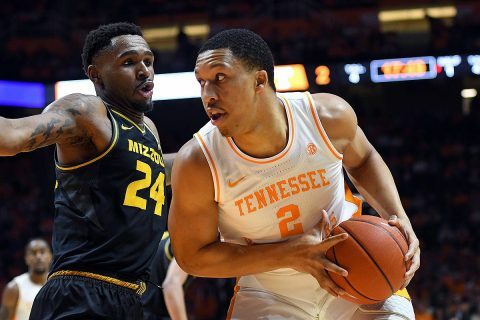 Four Tennessee players finished in double figures with Grant Williams and Admiral Schofield leading the way with a game-high 13 points apiece. Jordan Bowden had 12 points, while Jordan Bone (11 points) and Lamonte Turner (9 points) helped close out the game in the second half. Nine of Bone’s 11 points came in the second half as the SEC assists leader added a game-high seven assists and four boards. Trailing by six at halftime, the Tigers (11-10, 2-7) came out in the second half and cut the Tennessee lead to a two possession game. It wouldn’t last for long, as the Vols went on an 11-0 burst to push their lead to 50-35 with 14:58 left in the game. Tennessee continued their staunch defensive effort in the second half, holding Missouri to just 32.3 percent shooting from the field and 26.7 percent from behind the arc. Despite its shooting woes, the Tigers trailed by only eight with less than seven minutes remaining in the game. UT finally put Missouri away when it went on 7-0 spurt, capped off by a Turner three from the left wing to make it 67-52 with 4:26 on the clock. Kyle Alexander led the Vols with eight rebounds and four blocks to go along with six points. Five UT players had a block in the game as the team finished with nine in total, marking the fourth time this season the Vols have had nine or more blocks. With Missouri holding its largest lead of the game at 17-13 in the first half, Admiral Schofield knocked down a three pointer to help ignite an 18-2 run that gave the Tennessee the lead for good. The run was highlighted by an fast break alley-oop slam by Yves Pons from Kyle Alexander. Alexander stole the ball away and led the 2-on-1 fast break before throwing it up to Pons for the two-handed jam. Over the final 6:53 minutes of that run, Tennessee clamped down defensively, holding Missouri without a field goal. The run helped extend the Vols lead out to as much as 12 points as an Alexander bucket at the 5:13 mark made it a 31-19 game. The Tigers would bounce back late in the half as back-to-back three pointers by Missouri cut the lead down to five. After a pair of buckets late in the opening half, UT took a 37-31 edge into the halftime interval. Tennessee had balanced scoring throughout the first half as eight of the nine players who saw the court for the Vols in the first half scored. Williams had a team-high nine points at the break while Admiral Schofield chipped in eight points while knocking down both of UT’s three pointers. Tennessee recorded nine blocks during the win over Missouri, exceeding its season average of 5.8 per game. The Vols had six blocks in the first half alone. For the game, Kyle Alexander led the team with four blocks, which brings his career total to 163. Grant Williams (2), Admiral Schofield (1), Jalen Johnson (1) and Yves Pons (1) also blocked shots for the Vols. The Vols came into the game fourth in the country in blocks as tonight’s win marks the fourth time this season they have had nine or more blocks. 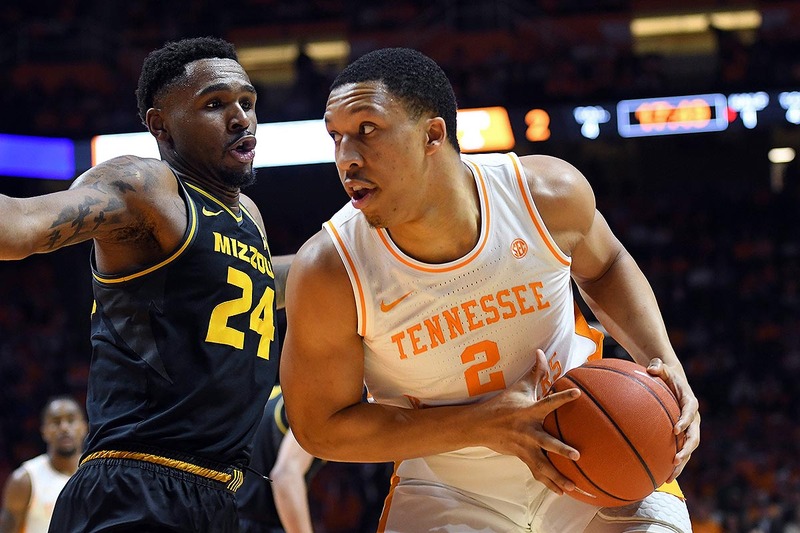 Tuesday’s win over Missouri completed Tennessee’s season sweep over the Tigers, as the Vols put together impressive defensive performances in each win. During Tuesday night’s win, the Vols held Missouri to a 35 field goal percentage on 23-for-65 shooting. In Columbia on Jan. 8, Tennessee held the Tigers to 37 percent from the field on 21-for-57 shooting. With the win over the Tigers, Tennessee has now won 13 SEC regular season games in a row, dating back to last season’s home win over Florida on Feb. 21. The Vols have also won 12 SEC home games in a row. Tennessee Vols continues its homestand Saturday when the Vols welcome the Florida Gators to Thompson-Boling Arena. Saturday afternoon’s tip-off is scheduled for 4:00 PM on ESPN.